Each of these Kermadec tree ferns is closely related to a (different) mainland New Zealand species. Can you tell which mainland species? One of the mainland species is well known by New Zealanders, at least in name, which is a big clue in itself. That one might be easy; the other is much harder. 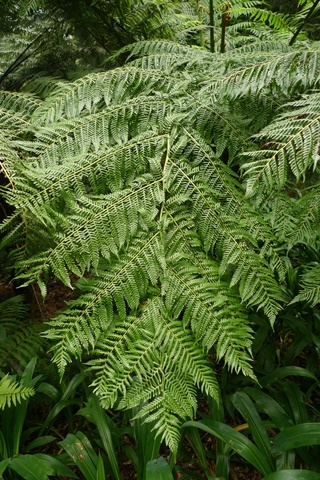 1 A. Cyathea milnei, from the Kermadec Islands, in cultivation at Otari-Wilton’s Bush, Wellington. Photo Leon Perrie. © Te Papa. 1 B. Cyathea milnei, from the Kermadec Islands, in cultivation at Otari-Wilton’s Bush, Wellington. Photo Leon Perrie. © Te Papa. 1 C. Reproductive structures of Cyathea milnei, from the Kermadec Islands, in cultivation at Otari-Wilton’s Bush, Wellington. Photo Leon Perrie. © Te Papa. 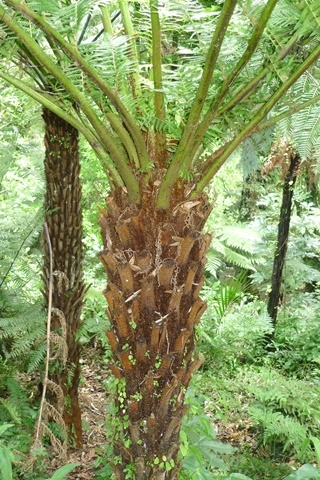 2 A. Cyathea kermadecensis, from the Kermadec Islands, in cultivation at Otari-Wilton’s Bush, Wellington. Photo Leon Perrie. © Te Papa. 2 B. 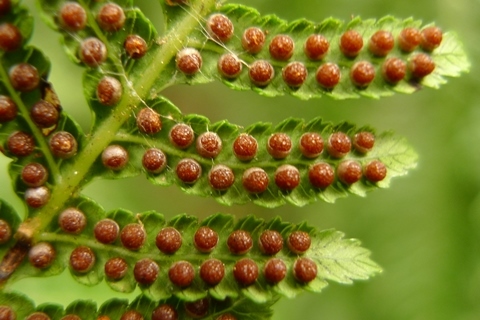 Reproductive structures of Cyathea kermadecensis, from the Kermadec Islands, in cultivation at Otari-Wilton’s Bush, Wellington. Photo Leon Perrie. © Te Papa. Leave a comment below if you think you can identify their mainland relatives. 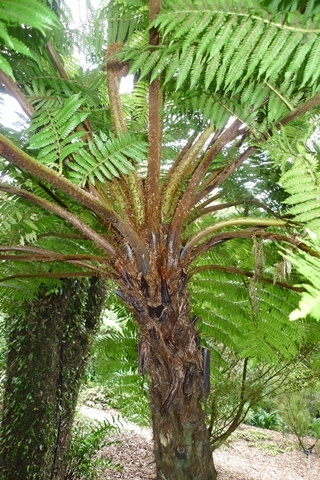 For help, try Te Papa’s online guide to New Zealand tree ferns. This blog post will help too. The tree ferns Cyathea kermadecensis and Cyathea milnei are indigenous only to Raoul Island, the largest of the Kermadec Islands. Raoul Island is about 1000 km north-east of the North Island, and has a subtropical climate. Wikipedia’s page on the Kermadec Islands. This public garden in Wellington is devoted to New Zealand’s indigenous plants. It is a wonderful place to see some of New Zealand’s most interesting plants. It is also a great scientific resource, bringing together plants from all over New Zealand. Te Papa’s collection of dried, plants contains multiple specimens of Cyathea kermadecensis and Cyathea milnei. But whole fronds of tree ferns are rarely collected; they’re just too big! And very few entire tree fern fronds have come all the way from the Kermadec Islands. This left Pat Brownsey and me short of measurements for our work on tree ferns for the electronic Flora of New Zealand. Fortunately the plants cultivated at Otari-Wilton’s Bush allowed us to address those gaps. Visiting these gardens is far easier than getting to the Kermadec Islands themselves. The electronic Flora of New Zealand. hi, I have a tree fern that grew crooked into a fence and now the top is very mangled and no new fronds have come out for over 6 months… can I cut off the top of it, where the fronds used to come out from, or will this kill the tree? Thank you. Most tree ferns won’t survive having their top cut off – it’s their only growing point (above ground). 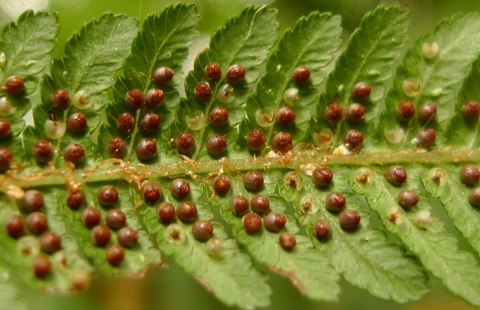 However, if you have Dicksonia squarrosa (http://collections.tepapa.govt.nz/topic/3745), it might cope with a beheading because it could have buds along the trunk that can give rise to new fronds. But no guarantees. Thank you Leon. I would not have picked the C kermadecensis to be like C cunninghamii. Are the fronds soft? I must look sometime. Hi Mick. The fronds are soft-ish, compared with a Dicksonia tree fern. I was interested to see how pale the crown (or top of the trunk and base of the frond stalks) is compared to C. cunninghamii, which, in my experience, is darker. Aside from lacking the white underside, Cyathea milnei looks a lot like C. dealbata. They have very similar trunks: in the top photo, in the centre is C. milnei, and to the left in the background is C. dealbata. Cyathea kermadecensis is similar to C. cunninghamii in that it doesn’t have the thick frond stalks of C. medullaris or the ‘skirt’ of dead frond stalks of C. smithii. Cyathea milnei is related to C. dealbata and C. kermadecensis is related to C.cunninghamii.